The Toi Tangata Hui ā Tau 2018 provided an opportunity to connect Iwi and health promoters, Māori academics, tertiary students, community leaders, youth workers, independent businesses and health practitioners from across the motu where kaupapa Māori practices will be promoted, shared and developed. This year, the Hui ā Tau took place on the 21-23 February at the Apumoana Marae in Rotorua and had a focus on taking stock of where we are at, what is working, what is not, and where we need to concentrate our energy to get the positive outcomes we desire. The theme Tātai Arorangi, drew inspiration from the knowledge system of the stars. Inspired by the kupu ‘Ko tātai arorangi he kai arataki i te ra,’ it spoke of how reading the stars once guided everything we did and how all components of our lives were guarded by these celestial bodies. Tātai Arorangi reminds us of our dependence on the taiao while challenging one another to consider if our respective communities are on track to flourish and prosper with the current direction, or if we must seek and explore fresh road maps to navigate into the future we want. The event offered three days of thought-provoking kōrero, interactive workshops and structured physical activities which challenged how we can successfully navigate these current times to build a resilient, prosperous and sustainable future through mātauranga Māori approaches. We had an exciting line up of keynote speakers and workshop presenters and each of their contributions challenged hui participants to consider ways in which we can move towards a future involving Māori Systems Thinking, Kai Māori Kai Ora, and Digital Innovation while being equipped to respond to the changing times in a way that enables Māori to prosper and live in a changing world as Māori. 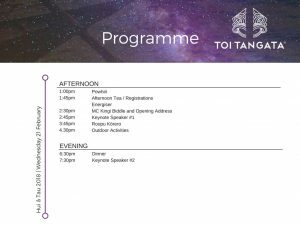 The Toi Tangata Hui ā Tau offered an exciting, uplifting, and inspirational setting that encouraged innovative thinking and meaningful activities that will make a difference for our whānau Māori. Our speakers included Dr Matire Harwood, Dr Rangi Mataamua, Dr Ihirangi Heke, Te Ururoa Flavell, Mapihi Raharuhi, Paora Te Hurihanganui, Dr Nina Scott, Dr Isaac Warbrick, Dr Anna Rolleston and many others. View our programme outline here.